I found another crinoid calyx similar to the ones found earlier but with a little bit more definition. I exposed this one with a split, the others were on the exposed surface of a piece of shale that was loose in the plowed up rubble. I was hoping to find more of these, this one was just a few feet from where I found the other two. The gastropod was a bonus. And of course, two more trilobite pygidia along with this small cephalon ... # 29. Mother nature has provided you with very eye appealing hash plates!!! Very "artistic" . Love to see your finds. That's a purty snail! Nice calyx and trilo-bit as well! That's an awesome find. Congratulations and thanks for sharing. That is not a crinoid. It is a Hexagonaria coral. Hi Joe, thanks for chiming in ! Here is another one I found about a month ago in the same area. Does this also resemble the Hexagonaria coral ? They do look quite a bit like Pleurodictyum corals. - Honestly that was my first thought on the first picture. But the presence of the single crinoid type columnal - (the first one posted here has what appears to be a 5 sided star shaped nub, the second has a pentagonal shaped nub.) in the center of the fossil has me scratching my head. Could be a coincidence, I guess. These specimens match well with the Mahantango crinoid: Arthroacantha sp. They do look quite a bit like Pleurodictyum corals. I have these labeled Pleurodictyum americanum from previous ID posts. - (the first one posted here has what appears to be a 5 sided star shaped nub, the second has a pentagonal shaped nub.) in the center of the fossil has me scratching my head. Could be a coincidence, I guess. In the first piece the 5 sided columinal does not match the 6 sided plates and there are no smaller joining plates. coral seems a good id. In the second one the columnal matches the surrounding pattern (both are 5 sided) and there are smaller joining plates around the columinal joint. Calyx sounds good for this one. Edit- In @piranha's diagram the columnal is round and the first plate is pentagonal, where as the op's pieces are different. I don't think one can get any closer than that for verification ! There is variability in different specimens. Here is another Arthroacantha sp. with all hexagonal plates. There is variability in different specimens. OH Duh! (emoji hits forehead). This is a polygon shape with star like patterns throughout. Hard to get a pic just right but hope you can make it out ok. It's an bryozoan of some sort. I agree that the specimen in question is an internal mold of a crinoid calyx. One thing that confuses me is that there appear to be 6 basal plates (assuming the central one with the attachment point is an infrabasal). 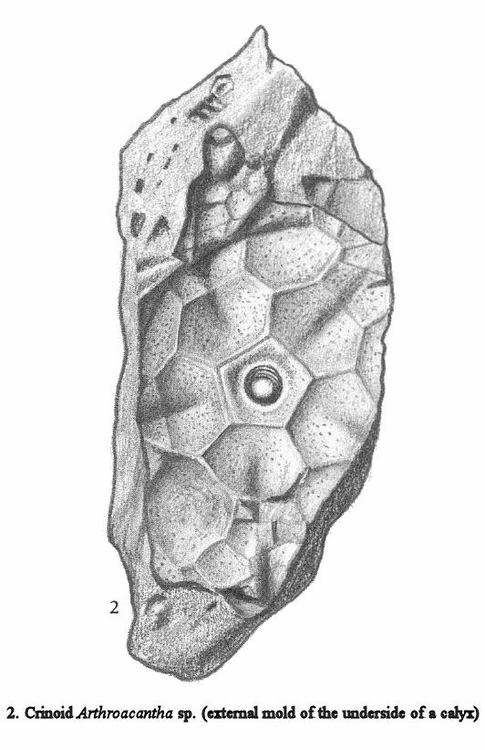 The illustration shows 5 basals, but the photo of another specimen shows 6 basals. 5 would be expected for crinoids in general (pentameral symmetry). 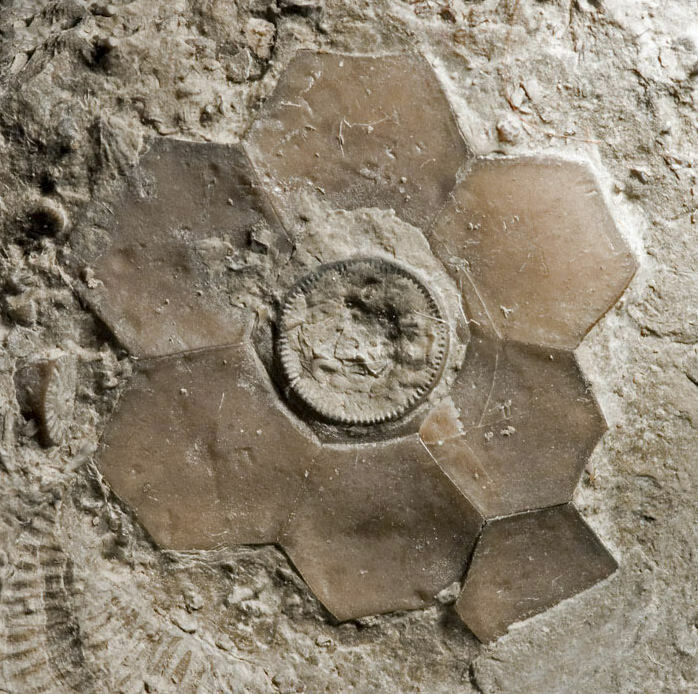 However a few crinoids, such as Hexacrinus, have an unusual 6-fold symmetry. Does Arthrocantha sometimes have an extra basal? Probably not. The photo showing 6 is from a google image search for Arthroacantha. After visiting the photo source, it's only listed as an unidentified Windom Shale calyx. The second specimen is a crinoid. Which crinoid, I have no idea. The first specimen still looks like a coral. I just used Hexagonaria because that is what I am familiar with. Not really a coral collector. Fantastic images, Id like to find a site like this! That cephalon with the eye sticking out is absolutely outrageous. Picked these up at lunchtime today. I'd almost rather find cephalons in good condition rather than complete trilobites buggered up. This little guy is # 33. I'm still amazed by those eyes. The mold of the underside of the moult is more impressive that the mold of the outer surface, especially regarding the eyes. Pretty eyes ! Ya really got some nice hash plates coming out of Your yard there!